Denver teachers, who have been on strike for three days, say they have a deal. Striking Denver public school teachers could be headed back to classrooms Thursday after reaching a "historic" deal with the school district to boost their pay. The Denver Classroom Teachers Association declared its three-day strike over and members are set to vote on whether to ratify the deal reached about 6 a.m. on Thursday with the Denver Public School District. "This agreement is a win, plain and simple: for our students; for our educators; and for our communities," union president Henry Roman, an elementary school teacher, said in a statement. (Michael Ciaglo/Getty Images) South High School ninth grade teacher Tessa Zatorski, left, chants while picketing outside South High School, Feb. 11, 2019 in Denver. The tentative deal invests an additional $23 million in teacher pay, boosting the base salaries of Denver's more than 5,600 educators by an average of 11.7 percent next year and providing cost of living increases in years two and three of the agreement, according to a statement on the Denver Public School District website. The agreement also reforms the overall pay system for teachers to make it less reliable on pay-for-performance bonuses, which the union had called cumbersome and unreliable. The deal creates a "20-step" salary schedule that will award teachers with higher pay for participating in professional development. The agreement also reforms the so-called "ProComp" system for teachers who work in the highest-poverty schools and in hard-to-fill position by providing incentives of $3,000 and $2,000, respectively. 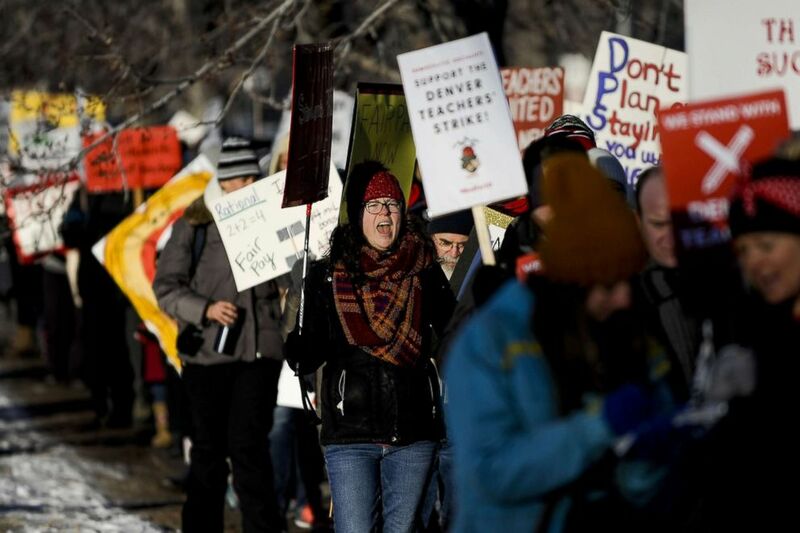 (David Zalubowski/AP) Teachers carry placards as they walk a picket line outside South High School, Feb. 11, 2019, in Denver. Details of the agreement are expected to be posted on the Denver Classroom Teachers Association website later Thursday. "Teachers are expected to return to work in order to receive pay today," the school district's statement reads. The agreement must be ratified by the entire union membership and approved by the Denver Board of Education. "We're very pleased to have reached this agreement that provides our educators with a fair, transparent, and highly competitive salary system," the school district's statement reads. The agreement not only ends the first teachers' strike in Denver in 25 years -- it concludes 15 months of sometimes acrimonious negotiations. Both sides of the labor negotiations hope the agreement will be enough to keep teachers from going to neighboring school districts to get a hike in pay. 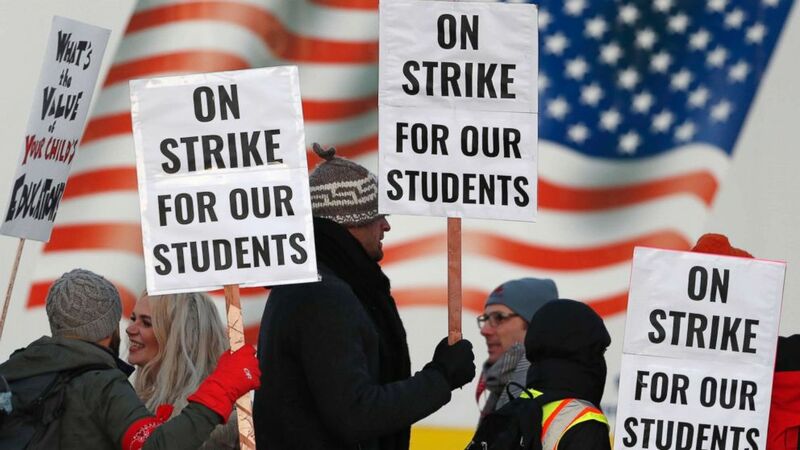 During the strike, union officials said the district had a teacher-turnover rate of more than 20 percent a year due to educators moving to other school districts to get a pay boost. Roman said the deal "provides stability for students who, for the past ten years, have had their education disrupted by a compensation schedule that drove their teachers away from the district." Amie Baca-Oehlert, president of the Colorado Education Association, praised teachers for "being brave and bold and for standing up for Denver students and our profession" in a statement. "They have led the way for our entire state by bringing to the forefront our students' need for qualified, committed, and caring educators that can afford to stay in the classroom and live in the communities where they teach," Baca-Oehlert's statement reads.